it's not going to compete on features with a Yaesu or Kenwood, but if you're just looking for better trail communications than CB, i think this will fit the bill. note that you probably want the newer "plus" (UV-5R+) model, not the original UV-5R - i read a fair number of complaints about how the menu system works on the original and that it was improved on the plus model. be sure to check out the amazon reviews and also the eham.net reviews (http://www.eham.net/reviews/detail/10755). i'd go ahead and get a different antenna. you'll get the best experience with an external vehicle mounted antenna, but even a quality on-unit antenna would be worth the cost. the Comet SMA24J or Diamond SRJ77CA would probably be good for on-unit replacements and are around $20. so for only $55, or $75 with a good antenna, there's no reason not to get your HAM license! Last edited by theksmith; 05-13-2014 at 01:50 AM. I do have one of those UV -5R's. Actually HAD , I just recently gave it to a friend because I just bought to try out the new UV-5RA (actually it should be here today). Supposedly the RA is pretty much the same as the R just an updated firmware and a different case from my old one. I'll have to see how I like it when it gets here. I have to agree the Baofeng is a pretty good little unit. Its not like my FT-60, but pound for pound, $ for $ you cant beat it. Oh and a BIG piece of advise... Get the programming cable when you buy the tx. Programming from the keys is a PITA, but with the cable, off your computer is a breeze. 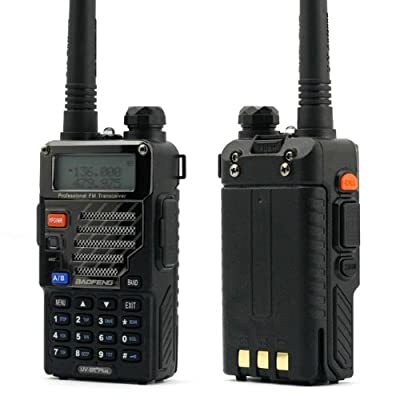 Great info on the 5R series of radios for those considering one. I didnt like the Baofeng UV-3R at all. The "guy in the van" just dropped off the new 5RA. I will keep ya'all posted, but my impressions so far are: 1. TX seems to be put together just as well as the old 5R, but just a little fancier with the cool black chrome grill. And 2. The lady's voice in the box is Much easier for me to understand. I hear that there is also a 5RE that is marketed for the European market....maybe British accent? Russian? French? IDK. Also,Im not sure of the 5R+ I havnt had one to compare to. Thanks for the info. I ordered one this evening! Don't do that. It's good to know how to manually program, but you'll waste too much time doing it. I could help you program it, if needed. I'm using Windows7 64bit and was able to get it to work with the Prolific drivers that came on the CD. The Baofeng software kept closing and opening itself, so I switched over to Chirp and it worked fine.